SPOILER ALERT - Dinna read unless you have read "Dragonfly in Amber". I really don't appreciate you acting like such a neanderthal regarding Claire's request to work at L'Hôpital des Anges. What do you think this is, the 18th century? Wait... nevermind. And so she waxed her legs and pits. Is it really such a big deal? I'm thinking "No" and that you should be happy to have such a forward-thinking lady by your side. YOU wanted her to stand out, did you not? Well... boyfriend... she followed orders and is now standing out and hanging with the Paris elite. So deal. OH and furthermore, I need you to be cool with her working at L'Hôpital because "Hullo, wee dog" is one of my favorite scenes in the whole bloody series, mmmmkayyyy? So please hurry up and get there. Well, I suppose I need to hurry up and hurry up and get there. Um... yeah. PS - Wait until you meet Mother Hildegarde. She reminds me of Sister Rafael from Archbishop John Carroll High School for Girls back in the 80s. I still have nightmares. "What...is a RHOMBUS??" LOL! Great post. And I like the Jamie-as-Neanderthal picture, too. ps - that photo is perfect! Hilarious! 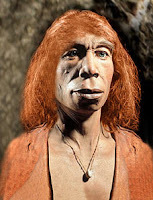 I soooo want to make neanderthal Jamie my Facebook avi! My college roommate played this Hildegard von Bingen CD all the time. It's great! Good reading in front of the fire background music.